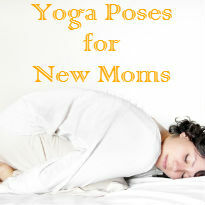 Yoga poses for new moms aren’t necessarily the same as the ones you’d do in a standard class. After all, your body is healing and undergoing a number of significant changes at the same time that you’re likely running on very little sleep. Still, when you take on the right yoga poses for new moms you may find that you’re doing yourself a bigger favor than you’d expected. They can help you to sleep more effectively (when you can! ), improve your emotional health and keep up your physical fitness. You can reduce aches and pains while bettering your flexibility. You’ll feel more refreshed and less fatigued. While it may be challenging to find the time to get into your yoga poses for new moms it’s worth it to give it a try when you can. Fortunately, this doesn’t require you to make noise or move around wildly. Many new moms find that they can fit a workout in during one of the baby’s naps. That said, others simply bring their baby onto the yoga mat with them for a bit of stretching and calm while hanging out together. This one is done while lying on your back on the mat. Bend your knees and place your feet flat down. Lay your arms down at your sides and raise your hips. If you are able to, slide your hands underneath you and interlace your fingers. Hold this position. This helps to open up the chest, back and even neck. It reduces pressure on the spine and can lower anxiety and fatigue levels. Kneel on your mat with your knees wide apart, letting your toes touch each other on your feet. Lower your forehead to the floor. Be conscious of your lower ab muscles and your pelvic floor. Think about raising the pelvic floor inward and upward. This is a restful pose while it strengthens the pelvic floor at the same time. This is an alternative version of the standard plank and can be accomplished by most people. Bring yourself into a standard plank pose only rest down on your forearms. Pay attention to aligning your shoulders, abdominal muscles, chest, hips and legs. Curl your toes underneath instead of back. This promotes spine and ab muscle healing and strengthening. Try to hold this pose for between 10 and 30 seconds. Set your knees down for support if you need to.